Quit4u is an innovative smoking cessation service which was commissioned by the Scottish Government and developed by NHS Tayside. The intervention was targeted at smokers in deprived areas of Dundee and has subsequently been implemented in disadvantaged areas of Angus and Perth & Kinross. The intervention, which was launched as a pilot in Dundee in March 2009, combines a ‘whole package’ of supports for people wanting to quit smoking. In addition to behavioural support (through groups or a pharmacy) and pharmacotherapy, quit4u offers a payment of £12.50, in the form of grocery vouchers, for every week participants are ‘smoke free’, up to a maximum of 12-weeks. Weekly carbon monoxide (CO) tests monitor whether or not someone has smoked over the previous week. The quantitative analyses drew on ISD smoking cessation statistics for the period March 2009 – December 2010. 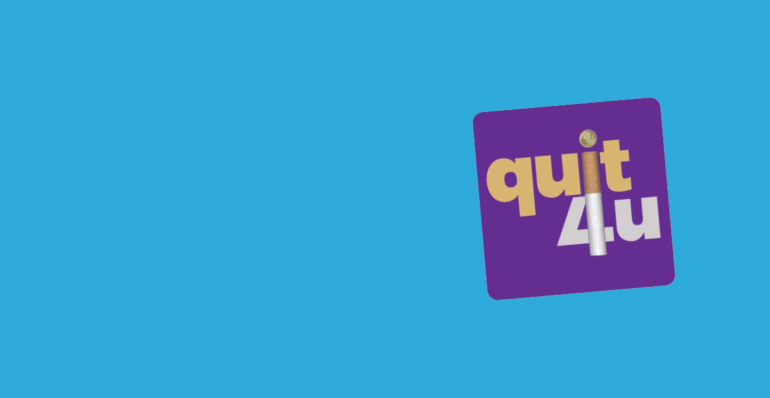 Quit4u quit attempts at one month, three months and 12-months post quit date were compared with a matched sample of similar quit attempts by people using NHS smoking cessation services either in Tayside or elsewhere in Scotland. More in-depth data on experiences of quit4u was obtained through in-depth interviews and focus group discussions with participants, a 12 month, small scale follow up survey of 130 recruits as well as interviews with service planners and professionals involved in delivery. Between the launch of Quit4u in March 2009 and the end of March 2011, 2,042 people had signed up to quit4u. Based on self-reported smoking status, as recorded for the purposes of the ISD smoking cessation dataset, quit4u had higher quit rates at one month, three months and 12-months post quit date compared with average quit rates for a matched population using other NHS smoking cessation services in Scotland (figure 1). Figure 1: Comparison of Quit4U and Non-Quit4U self-reported quit rates at one month, three months and 12 months post quit date. It is also noticeable that Quit4u had lower levels of ‘lost to follow-up’. This reflects greater continued contact between the service and clients, which in turn is likely to have improved quit rates. This does though mean that there is some uncertainty about the exact size of the difference in effectiveness between quit4u and non-quit4u smoking cessation services because it cannot be assumed that all cases ‘lost to follow-up’ are failed quits attempts. The increased effectiveness of quit4u, in terms of increased effectiveness, seems to be particularly influenced by the achievement of much better quit rates than expected among those attending pharmacy-based services. 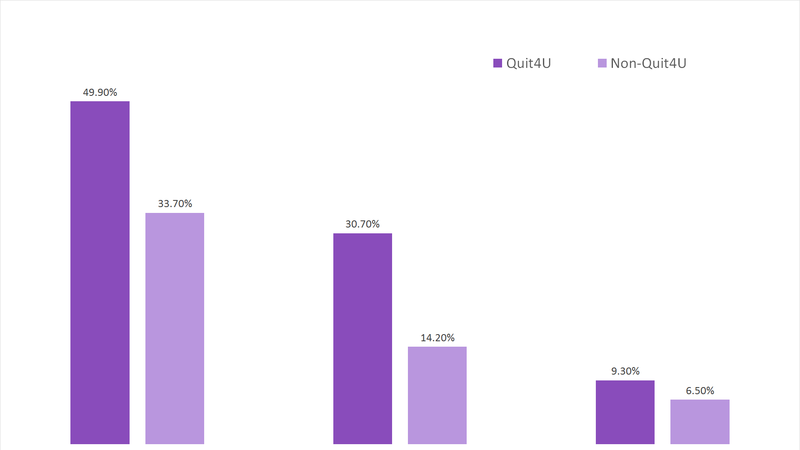 Around 44% of Quit4U attempts were made with group support, compared with 18% of non-quit4u attempts. Although the differences between quit4u and non-quit4u quit rates3 4 5 were less pronounced for those obtaining support through groups compared with those attending pharmacy services, in general group support tends to be associated with higher quit rates. Quit4u also makes use of rolling groups which people can join and continue attending for as long as they feel it is useful. Quit4u participants found this of benefit, providing them with an opportunity to learn from others at different stages of their quit attempts. The weekly CO testing in groups and in pharmacies was identified by participants as an important motivator in encouraging them to continue with their quit attempt. In addition, the CO testing may have helped to provide an additional focus for encouragement and support. Proportionately more quit4u attempts were made using varenicline, compared with the rest of Scotland (18% compared with 11%). Other evidence has shown varenicline to be associated with higher quit rates (6). Similarly, for people signed up to quit4u, the use of varenicline was associated with higher quit rates at one and three months compared with other kinds of pharmacotherapy. Around one-third of quit4u participants interviewed for the small scale survey felt that the financial incentive encouraged them to sign up to the scheme. The geographical focus of quit4u encouraged people to sign up with people they knew, providing an opportunity for support from friendship and kinship groups. The evaluation shows that quit4u is both an effective and a highly cost-effective model for encouraging people living in areas of deprivation to attempt to quit smoking. While the financial element has a role to play for at least some people, what emerges from the evaluation is the importance of the ‘whole package’ – the combination of elements which together encourage people to sign up and stay engaged with the service. Thanks to Fiona Myers, Public Health Adviser, NHS Health Scotland, Rachel Ormston, ScotCen Social Research, Amanda Amos, University of Edinburgh and Marjon van der Pol, University of Aberdeen who led the evaluation. Special thanks to Fiona Myers from whose original paper this article has been derived. Ormston, R. et al. Evaluation of quit4u, Edinburgh: NHS Health Scotland; 2012. http://www.healthscotland.com/documents/5827.aspx. ISD NHS. Smoking Cessation Services Statistics (Scotland) 1 April 2008 to 31 March 2011, Edinburgh: NHS ISD; 2011. Brose, L, et al. 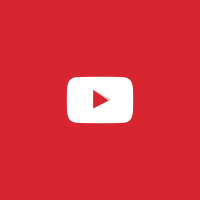 What makes for an effective stop smoking service? Thorax. 2011; 66: 924-926. Bell, K, et al. NICE Rapid Review – The effectiveness of NHS intensive treatments for smoking cessation in England, London: NICE; 2006. Bauld, L, et al. The effectiveness of NHS smoking cessation services: A systematic review. Journal of Public Health. 2009; 32(1): 71-82. NHS Health Scotland and ASH Scotland. 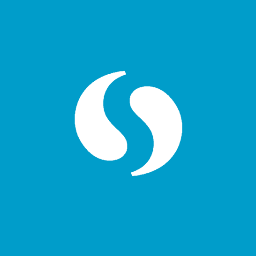 A guide to smoking cessation in Scotland, Edinburgh: NHS Health Scotland; 2010. This article, written by Paul Ballard & Andrew Radley, NHS Tayside, was originally published in Volume 3, Issue 3 of the SCPN Newsletter. 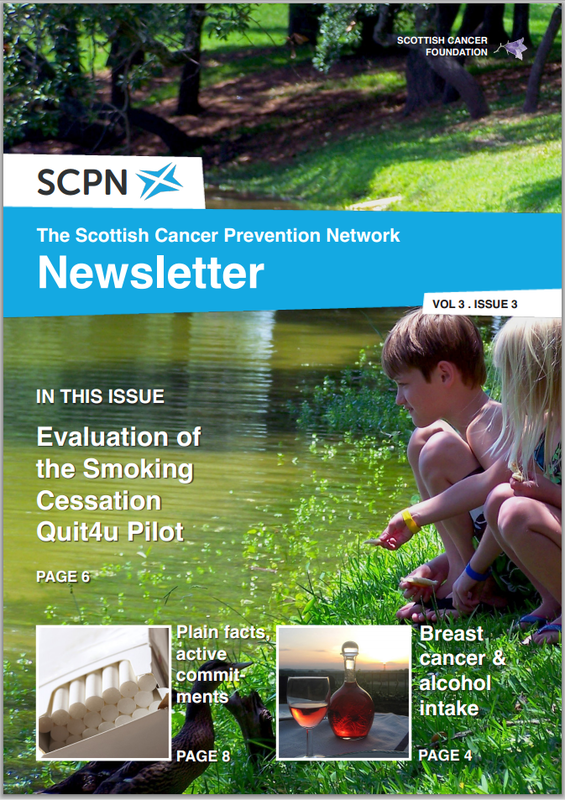 In this issue, we evaluate the Quit4U smoking cessation pilot, cover plain cigarette packaging in 'Plain facts, active commitments,' explore the links between alcohol intake & breast cancer, and more.